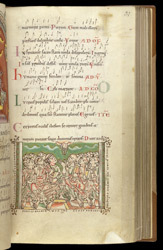 Made up of fragments from a late Anglo-Saxon liturgical chant book, the Caligula Troper's illuminations introduce songs which would be inserted into the mass on special feast days and sung by a soloist, hence the book's small scale. The pictures' geometric abstraction of form and use of vibrant colours embellished with gold give an opulence that speaks of manufacture for use by an important figure. It is named for its 17th-century position in a bookcase supporting a bust of Caligula in the Cotton rare books library. Its selection of tropes (songs) and where it was in the Middle Ages suggest origins at Winchester or Worcester. The Common of the Apostles is introduced by a picture of the apostles blessed by the hand of God. It is an idiosyncratic image, with no known parallels in other medieval works, and its execution appears rushed. Almost certainly the artist used a depiction of the Pentecost as a model, modifying it to exclude the Virgin and Holy Spirit but retaining conventional depictions of Peter (with his keys) and the bald, bearded Paul.